Talks on resolving the Honduran political crisis headed toward failure Wednesday when the interim government indicated it would reject a mediator's final proposal for returning ousted President Manuel Zelaya to power. Zelaya, who is in neighboring Nicaragua, declared the mediation effort a failure and vowed to return to Honduras on Friday without an agreement. He said he would travel to northern Nicaragua on Thursday and try to cross the border by land the next day accompanied by his wife and children. "The coup leaders are totally refusing my reinstatement," Zelaya, who wore a white cowboy hat and arrived escorted by local police, told a news conference in the Nicaraguan capital, Managua. "By refusing to sign, (the talks) have failed." Costa Rican President Oscar Arias, who mediated the talks with U.S. backing, presented an 11-point plan that called for Zelaya's return to the presidency in two days and offered amnesty for the coup leaders that ousted him. Arias said the plan was his last attempt at mediating a peaceful solution to the conflict. He said Zelaya and the interim government should turn to the Organization of American States for a new mediator if they refuse to sign the agreement. Arias warned both sides that time was running out for a peaceful solution and urged them to set an example by becoming the first country in modern history to reverse a coup through a negotiated agreement. "The clock is ticking fast, and it's ticking against the Honduran people," Arias said in Costa Rica's capital, San Jose. "I warn you that this plan is not perfect. Nothing in democracy is perfect." Mauricio Villeda, of interim President Roberto Micheletti's delegation, said he would take the proposals back to Honduras to present to the president, congress and the Supreme Court for consideration. But Micheletti's foreign minister, Carlos Lopez, flatly rejected returning Zelaya to the presidency, saying the executive branch cannot overturn a Supreme Court ruling forbidding the reinstatement of the ousted leader. "A proposal of that nature is inconceivable, unacceptable," Lopez told Radio America. Micheletti's refusal to budge comes despite stepped up pressure from the United States and other nations, which have warned of tough sanctions unless Zelaya is restored. Rixi Moncada, of Zelaya's delegation, called the mediation efforts a failure and called on the United Nations and the OAS to "adopt the coercive measures necessary to force the interim government to submit" to the resolutions that both organizations have approved calling for the return of Zelaya. "The mediation had only one goal: to enforce the mandate of the OAS and restore the constitutional order in Honduras with the return of President Manuel Zelaya," Moncada said. "That is why, for us, the Accord of San Jose has failed." Zelaya had given mediators a midnight deadline to achieve his reinstatement, threatening to return to Honduras with or without an agreement and seek the prosecution of leaders of the coup that forced him into exile. Such a scenario risks provoking violence: thousands of Honduras have protested almost daily since the June 28 coup both against and in favor of Zelaya. On Wednesday, tens of thousands of Zelaya foes took to the streets in the biggest show of opposition yet to his return. Arias' plan is similar to an earlier proposal that Micheletti rejected. It includes a timetable that would return Zelaya to Honduras by Friday to carry out the rest of his four-year term, which ends in January 2010. It calls for establishing a power-sharing government by July 27 and holding presidential elections a month early on Oct. 28. The plan also would force Zelaya to drop efforts to change the Honduran constitution, an initiative that provoked his ouster. Zelaya angered many people in Honduras by ignoring Congress' and the courts' rejection of his effort to hold a referendum on changing the constitution, which many saw as an attempt to abolish presidential term limits and impose a socialist government in the style of Venezuela President Hugo Chavez. The reconciliation plan would provide Zelaya immunity from prosecution for trying to hold the referendum, along with amnesty for coup leaders. Arias said he included several new points, including some proposed by the interim government with the help of a U.S. senator, who has not been identified. Among the new ideas was a truth commission to investigate the events leading up to the coup. Tens of thousands of Micheletti's supporters rallied in the Honduran capital on Wednesday in one of the biggest demonstrations seen yet. Many chanted "Honduras! ", waved the country's blue-and-white flag and wore white shirts printed with the slogan "I'm Defending My Constitution." They accused Zelaya of being a Chavez pawn. "They wanted to impose communism on us, and we don't want to be communists," said retired gardener Florencio Mejia, 80, as he marched in a blue-and white baseball cap, clutching a Honduran flag. Dentist Julia Garcia echoed Micheletti's comments that the country would tough out economic sanctions from other countries. "We prefer six months of isolation, to losing our liberty," Garcia said. 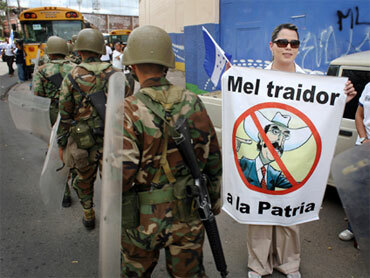 Tensions remained high, as marchers and Zelaya supporters exchanged shouts and insults. "These people have all been paid to march, and their bosses would fire them if they didn't come," said Zelaya supporter Alba Galindo. No foreign government has recognized the Micheletti administration. Deputy State Department spokesman Robert Wood, speaking to reporters in Washington, said Secretary of State Hillary Clinton warned Micheletti's government in a phone call over the weekend. U.S. officials are considering sanctions and the European Union has already frozen 65 million ($92 million) in development aid and warned of further steps. "The secretary of state made very clear that Mr. Micheletti, the de facto regime, needs to take this mediation effort seriously and respond appropriately," Wood said. "Should that not happen, there are clear consequences with regard to our assistance to Honduras." Zelaya told Honduras' Radio Globo that he was gathering Hondurans and Honduran exiles in neighboring countries to participate in his return, and said that once he was reinstated as president, "a process of dialogue and reconciliation and forgiveness will begin, but there will be trial for those who carried out the coup."